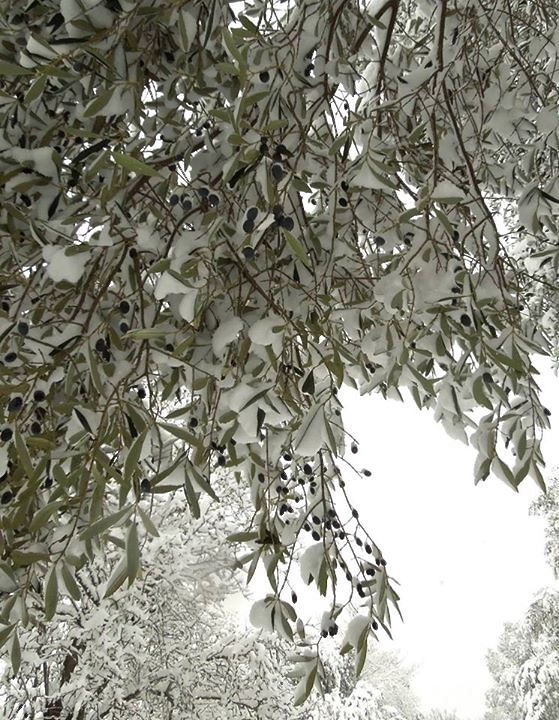 Olives infested with olive fly still on the tree during the December 31, 2014 snowstorm here (Photo credit: Amanda Roelle). Peperoni Ripieni can be included as part of an appetizer selection—or eaten all by themselves. Everybody has one. Whether you are a world class chef or a home cook with a week’s worth of dinner menus on regular rotation, you are inevitably known for one special dish—the one you never get tired of making. Friends always want the recipe, you count on it to be great every time you serve it and you can make it in your sleep. It’s your signature dish—your piatto forte. 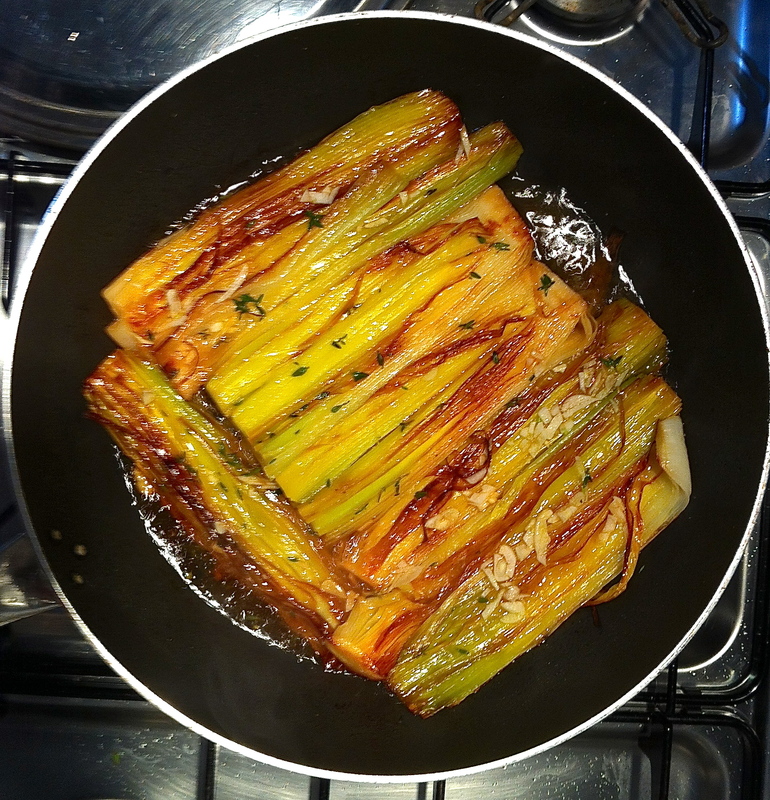 Braised Leeks are a favorite piatto forte that rival Peperoni Ripieni for requested appearances. You probably can’t remember how you came to be associated with your piatto forte. Maybe you found a recipe that intrigued you so much that you just had to try it. Your initial effort was met with enthusiastic approval, so you found yourself recreating the dish for guests, growing more confident with its execution with every repetition. Or maybe you learned it from your grandmother, adjusting the recipe over time to make it your own. By now, you never even look at the recipe, though, so ingrained is the process of crafting your signature dish. You can reproduce it when you’re away from home in someone else’s kitchen, even without access to familiar, go-to ingredients. Whether your piatto forte is as basic as guacamole or as complicated as paella, you’ve made it your own and the world is a happier place because of it. 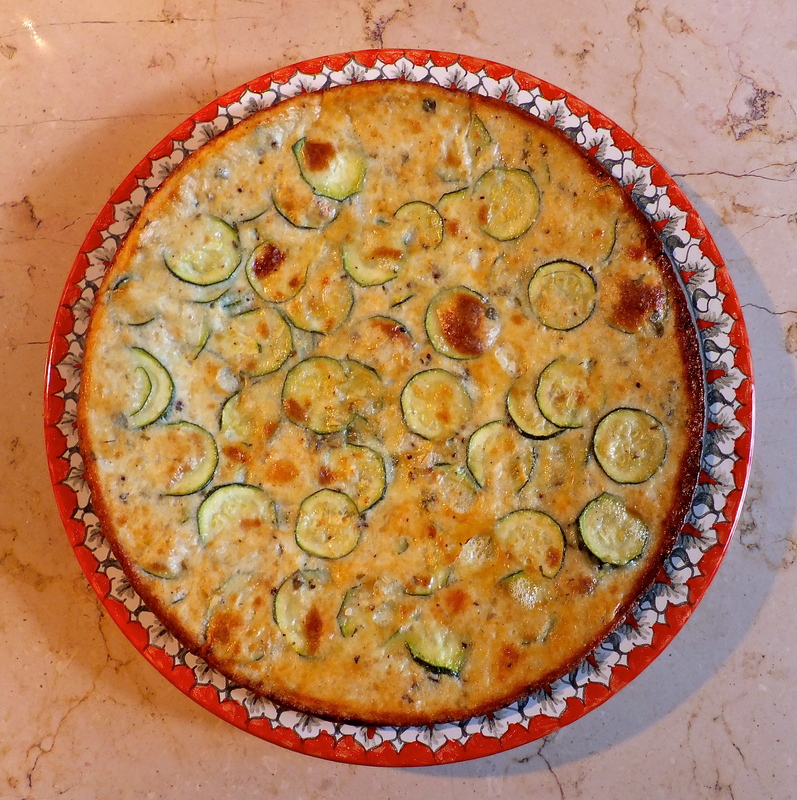 La Scarapaccia, a hybrid frittata from Tuscany, is another contender for piatto forte status. I make it every chance I get when zucchini is plentiful, especially when I can find zucchini flowers. meal to come. Antipasti are a great vehicle for in-season vegetables, too. The best ones offer contrasting textures and flavors along with visual appeal. 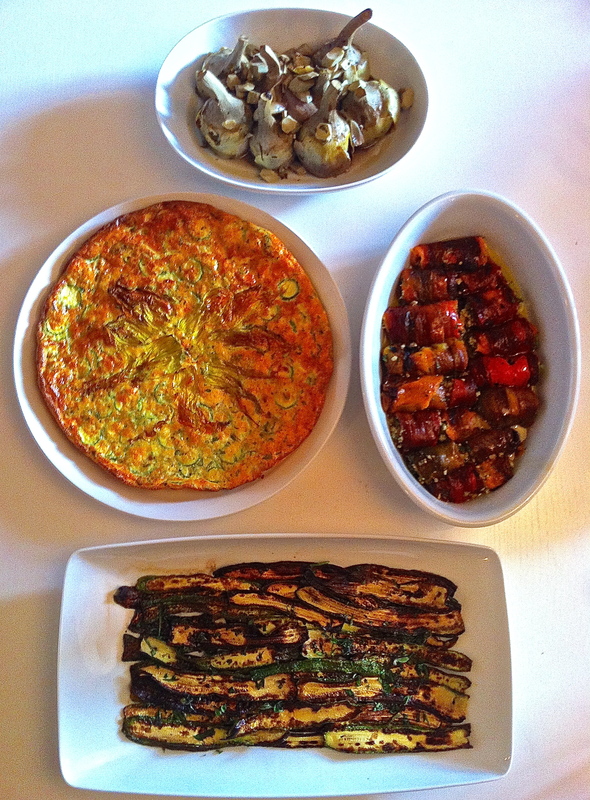 And antipasti can be designed to comprise an entire meal, offering intriguing tastes without overwhelming guests. 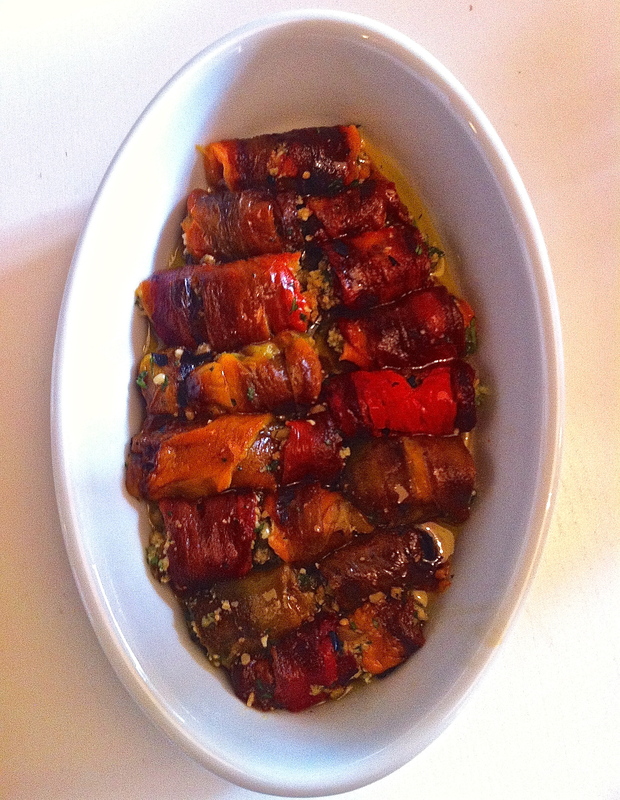 Peperoni Ripieni are versatile, easily prepared from readily available ingredients and very, very good to eat. 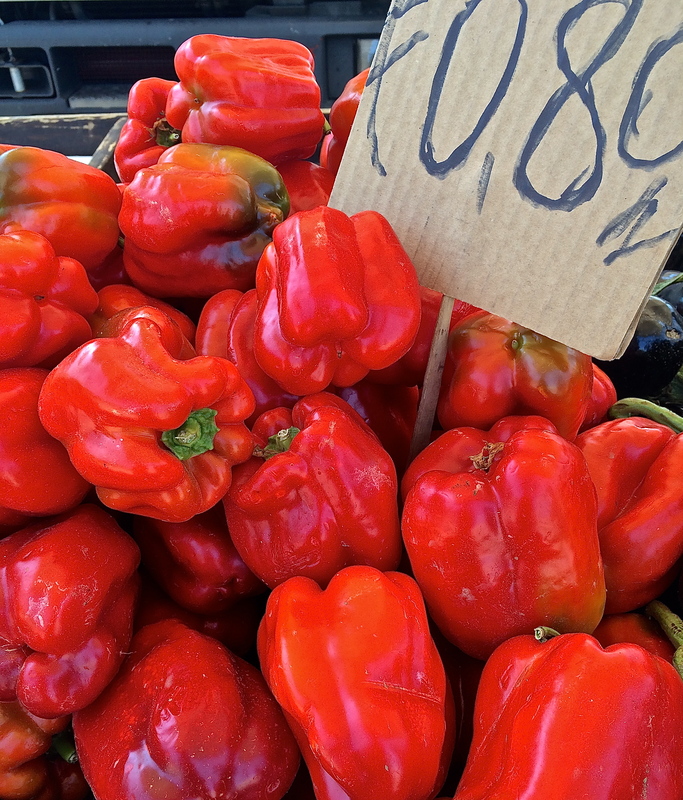 I have already shared my family’s all-time favorite—Braised Leeks— in another post, but Peperoni Ripieni (Stuffed Peppers) run a very close second. I learned how to make them when we visited Puglia for the first time almost 20 years ago and still make them for Italian friends here—a very tough crowd. Now that shiny, fleshy red and yellow peppers are dominating our local vegetable market, I am rediscovering why this recipe lives at the top of the list, ticking off all of the elements that transform a recipe into a piatto forte. Peperoni Ripieni can be made well in advance. Their baking time is flexible and they can be eaten hot from the oven or, even better, at room temperature. Their filling is equally flexible, rendering them highly customizable, which is how they could easily become your own personal piatto forte, too. Don’t be tempted to skip the pepper roasting and peeling process, though. In addition to creating one of the most addictive kitchen aromas ever, the flavor of freshly roasted peppers just cannot be replicated with jarred or canned peppers. 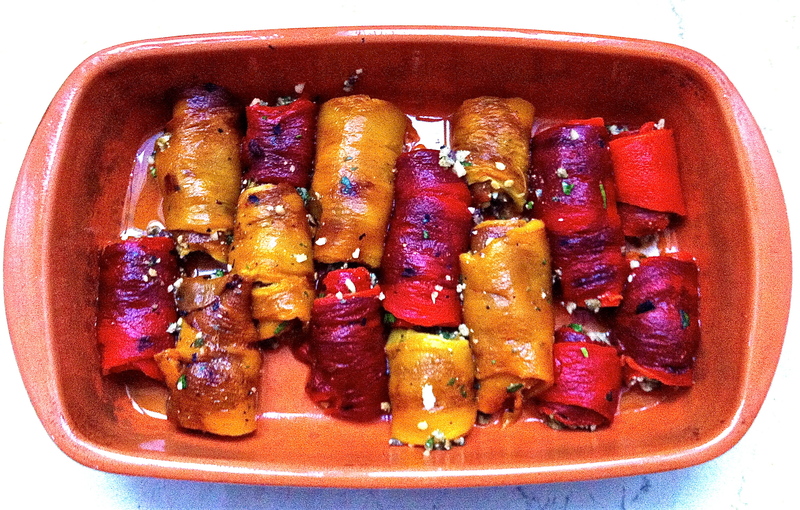 Peppers are abundant in the vegetable market now, making stuffed peppers are a perfect summertime piatto forte. 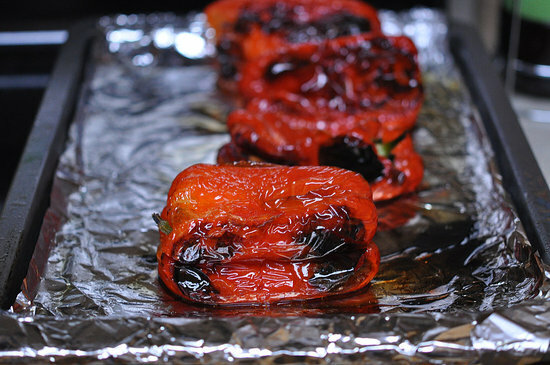 Roast peppers on a foil-lined baking sheet under the broiler until they’re blackened on all sides. First, roast the peppers. Set the oven to broil and cover a baking sheet with aluminum foil. Place the peppers on the baking sheet, then put the baking sheet in the oven about 4 inches from the broiler unit above them. Roast the peppers until the side facing toward the broiler is blackened, then carefully rotate each pepper and broiling until each pepper is thoroughly blackened. Place the blackened peppers in a resealable plastic bag and let rest for 15-20 minutes or until cool enough to handle. After removing the seeds and membranes, the peppers are placed on paper towels to drain while making the stuffing mixture. 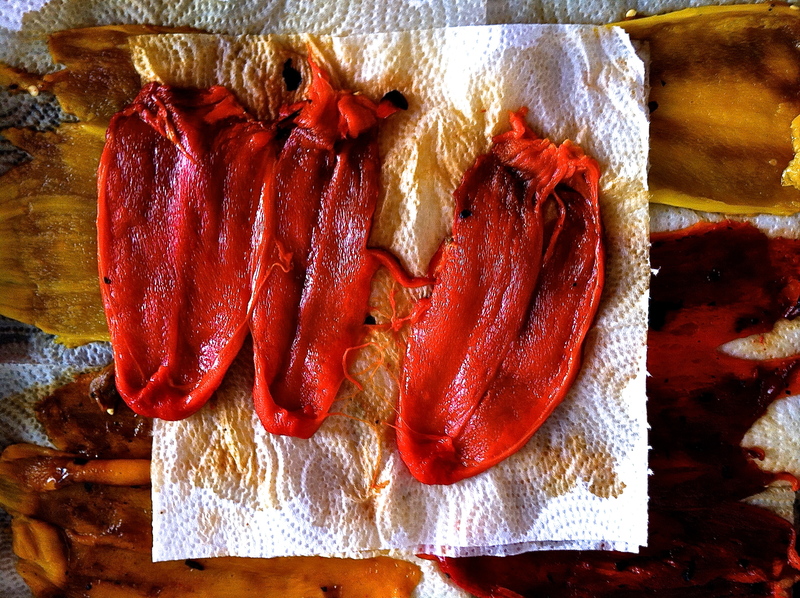 Carefully remove the peppers from the bag, one at a time, as you peel the blackened skin from the flesh underneath. Remove all seeds and white, pithy membranes. Lay each pepper flat on paper towels to absorb excess moisture. Don’t be tempted to remove the skin by running cool water over the surfaces of the peppers; water dilutes the exceptional pepper flavor. Sometimes the peppers will separate into sections. This is fine as long as the pieces are at least 2 inches wide. For each pepper, you should end up with four pieces, each of which will be stuffed with the filling mixture and rolled up. Stuffing ingredients are moistened with extra virgin olive oil and mixed well. 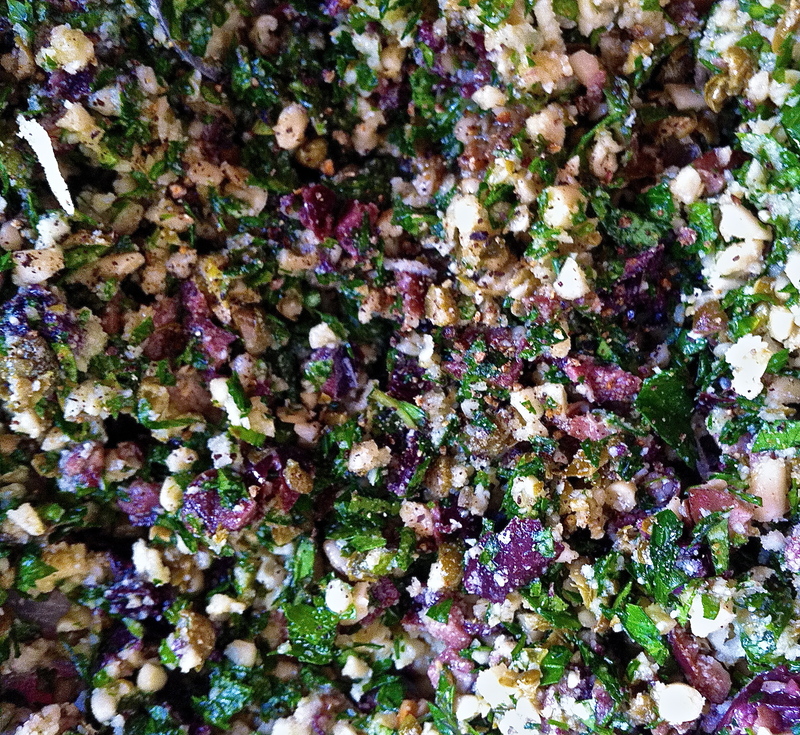 While the skinned peppers are draining, mix the capers, pine nuts, anchovy, breadcrumbs, and parsley. Add the extra virgin olive oil and mix well. Add salt and pepper to taste. If the peppers aren’t already separated in 2-3 inch-long pieces, slice them accordingly. In an ovenproof dish, swirl a little extra virgin olive oil into the bottom to coat thoroughly. On the inside side, place a heaping teaspoon (approx.) of filling at end of each pepper piece closest to you. Carefully roll up the pepper piece to enclose the filling and place the roll, end underneath, in the baking dish. Repeat this process until all of the pepper slices are filled. Drizzle a little more extra virgin olive oil over the tops of the pepper rolls. Peperoni Ripieni can be prepared to this point earlier in the day, then baked before serving. Bake the rolls in a hot over (400 to 425 degrees) until they are hot, with a golden toasty appearance on the top. Serve them hot, or let them cool to room temperature and serve as part of an antipasti selection. You can also prepare them early in the day, waiting until just before serving to bake them. Serves 4-6 as part of an antipasto (appetizer) selection. Note: In Naples and Sicily, it’s not unusual to find currants or raisins added to the filling mixture. To do this, soak 2 Tbsp. of currants or raisins in hot water for 15 minutes, then drain, chop and add them to the filling mixture. Bella and her newborn baby lamb in the countryside near Cisternino, Italy.